No, no, no, we are not banning memes! 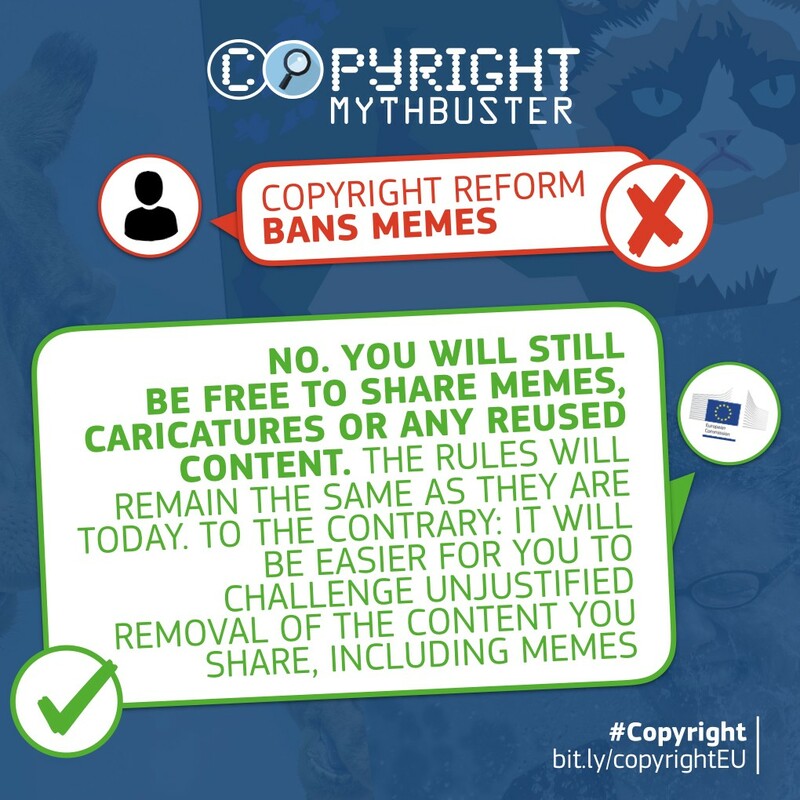 The European Commission copyright proposal will not kill memes, online encyclopaedias or the way we use internet. No, we are not banning MEMEs. The Copyright directive proposal does not have anything to do with “fair use”, as it is known in the United States. Images and other types of content used to make fun and have a laugh will not be affected by the new rules, parody and pastiche enriches our culture, and makes the online world — and not only — much more enjoyable. To be more precise, memes are already legally protected in the EU by a parody exception in the original copyright directive from 2001 and by several other legislative acts. Actually, the proposal introduces a further protection for authors of memes or any other parodic content: we proposed a compulsory mechanism to allow authors to ask social media platforms to republish blocked or removed content — it is called “redress mechanism”. The procedure is similar to the appeal processes already used by all major online platforms, such as YouTube and Soundcloud. So, in reality our Copyright proposal strengthens the rights of the author and reinforces freedom of speech online. Nothing changes with regards to your rights to publish content online. Don’t worry, that is not happening! The contributors to online encyclopaedias — like Wikipedia — are, above all, creators of their own entries. They own the rights to their contributions, made available under creative commons licenses. The vast majority of content on Wikipedia is uploaded with the consent of their rights holders. So who does actually article 13 target? Article 13 addresses platforms with large amounts of user-uploaded content, it does not affect users in any way. The article targets services that financially profit from user uploaded content, that have become major sources of access to copyright protected content. We want to protect creators and authors online, and allow them to be fairly remunerated for the uses of their material online. 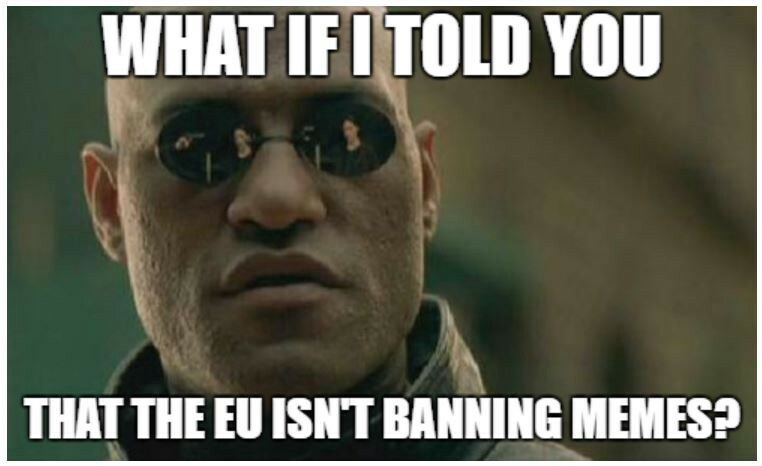 Article 13 will not lead to a “meme” ban. The parody exception is here to stay. In addition, it will not affect online encyclopaedias such as Wikipedia. Most content in online encyclopaedias is user generated and the user licenses it under Creative Commons. Why do we need copyright reform? It is all about protecting YouTube creators! Please note that these blog posts relate to the European Commission proposal on Copyright Reform. The Commission proposal is under discussion between the European Parliament and the Council of the EU. The new rules will enter into force after the agreement is found and the Directive is officially adopted. The European Commission acts as an honest broker to help find a solution that is acceptable for all of us and which ensures a balanced outcome for all stakeholders, while maintaining the objective of the Commission’s proposal.